Gravity Medical Spa is pleased to announce the availability of the new AQUAGOLD® fine touch™ microchannel device from Aquavit Pharmaceuticals. Gravity Med Spa is one of the first locations in the area to provide AQUAGOLD treatments, which can be used in combination with other common procedures such as neuromodulators, Hyaluronic Acid and many other aesthetic treatments. 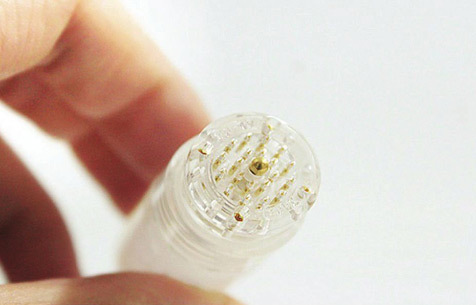 AQUAGOLD® fine touch™ is a unique microchannel device that effectively and comfortably delivers small droplets of treatment solutions directly into the skin allowing for greater absorption of the active ingredients. AQUAGOLD® treatments provide an enhanced ability to address fine lines, increase collagen stimulation and improve overall moisture and rejuvenation of the skin. Delicately delivers treatments for improving skin quality and skin health. Painlessly, easily, and effectively delivers treatments with 99.9% pure gold-plated surgical grade stainless steel microchannels, each thinner than a human hair. There a 20 needles that are single use only for sterilization. 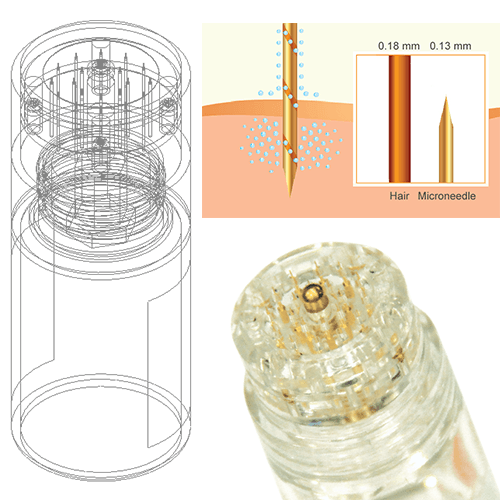 The micro-needles are thinner than human hair at just 0.6 mm long and 0.13 mm wide. ARE THE NEEDLES REALLY MADE OF GOLD? The needles are surgical stainless steel tips that are covered with pure gold. The stainless provides structure and the gold prevents irritation and allergic reactions that occurs with other metals. WHAT ACTIVE INGREDIENTS DO YOU USE? Our aesthetic nurse practitioners customize a formula of botox, bellotero and juvederm to reduce wrinkles and very fine lines, treat rosacea and fill or contract large pores.